Unam Sanctam Catholicam: Is Mount Sinai in Saudi Arabia? You have listed many reasons why this isn't the Mt. of Moses, but fail to find ANY of these same artifacts at the tradtional site. Seriously, Where in the world do you find all of these Artifacts located in the same region matching up perfectly with the Biblical Account? Where? Certainly not at the traditional site which you so strongly hold onto! Your certainly dead wrong on Galations 4:25 for he is speaking of the Arabia hagar went to, which was given that name long before Modern Day Saudi Arabia. Your grasping for straws by trying to disprove this site... If you gave the traditional site this same examination... then I bet everything would be a different Story. My friend, you should forsake the traditions of Men for the truth of God. Well, first of all, I do not think this issue of of any great importance. It is a matter of scholarly interest, and not at all something I would bother getting worked up about. Secondly, even with the supposed evidence at Jebel-al-Lawz (and the carvings are suggested to be neolithic in origin), I have a problem with it in that it was never proposed as Sinai until Muslim polemicists argued it was so during the Crusades...Christians from the time of Christ venerated another mountain. I would be wary of it for that reason alone. The chariot wheel is interesting, but I think more than just one would have been turned up if Pharoah's entire army had been drowned there. What about the possible site where the Gold Calf was worshiped? They found carvings of cows on the rocks which isn't normal for Saudi Arabia. what about the 12 stone pillars? What about the land markers? I just think its interesting. We shouldn't have to go searching for a lot of archeological discoveries in order to believe. I just watched a DVD on this today and I'm researching to see what those have to say that oppose this theory. I think the fact that you are trying to disprove where the "Real" Mt. Sinai is shows your insecurities! Every piece of evidence that Ihave seen of Mt. Sinai based on the Biblical descriptions, shows that Mt. Sinai is in Saudi Arabia. Maybe you need to ask God to give you a different kind of heart. First off, I don't have to do any research before criticizing one side or another. This is a blog, my blog, not a freakin' scholarly peer-reviewed journal. 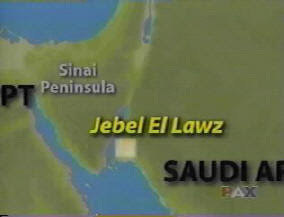 If I want to I can say, "Jebel-al-Lawz is not Mt Sinai" and give no reasons if I feel like it. I have attempted to give the best reasons as I know them, and if its not scholarly enough for you, then stick to the books and don't read amatuer blogs. Second, you sound like you already have a prediliction for the Saudi Arabia site. You can never prove that it is Mt Sinai - you can only interpret evidence as supporting one or another position. I'd be interested to see what you find. Question, do you believe that the Mount Sinai in the Sinai Peninsula is the true location? If you do, please provide evidence to support this claim. I have yet to hear from anyone (not just you) that evidence has been found to show hundreds of thousands of people stayed in the Sinai Peninsula location after the exodus. Thanks in advance. I'll tell you why I am still leaning toward believing that Mt. Sinai is in modern-day Saudi Arabia. I don't know if it's Jebel al Lawz or not. 3 big reasons for me. First, when the Israelites go into the Promised Land following the 40 years, they approach across the Jordan River. Well, the Jordan River is of course on the other side of Canaan. They would have been on the east of Canaan prior to crossing it. They may have passed through Edom to the south, but they could have done that any time in 40 years. Second, as the Israelites were wandering for 40 years in the wilderness, they would have without a doubt run into the Egyptians again. There is no reason the Egyptians would have avoided the huge peninsula to their east. Third, the whole narrative lacks urgency. The Israelites pack up and move southward, still in Egypt, staying in Egypt proper the whole time until they reach the sea. Goshen was right on the border of the Sinai peninsula, another reason to suspect the Egyptians would have had troops in the Pensinsula, because otherwise Hebrew slaves would be escaping constantly. Unlike others on here, I don't have anything negative to say to you. Just asking your opinion. But I'm Catholic, as well. I think some of the other commenters had a different axe to grind. I would surely support a South Sinai location for Mt. Sinai. The main reasons are 1. "Abraham dwelt between Kadesh (Perhaps Qudeis or Qudeirat, but this is by no means certain) and Shur, and then sojourned in Gerar" (assuming it is Tel Haror). If the Lawz claim is true, this statement would make no sense, as in the Lawz view, Shur is east of Aqaba. Also, Shur's location east of the Delta is corroborated by Hagar fleeing to Shur (Hagar was an Egyptian, and it would make sense if Shur was at the conventional location, east of the Delta, but no sense if it was east of Aqaba). The other main complaint I have against Lawz is that it is way too dry. The chariot wheels of Wyatt are either fakes or 19th/20th century AD handwheels. Real chariot wheels are not gold-plated and are buried deep under sediment. The pillars- Nabataean or Roman. The Egyptians only had control in the North Sinai peninsula and at the easily avoidable Serabit el-Khadim. In Paul and Josephus' day Arabia Petraea included the Sinai Peninsula. In my view Crossing= South Ballah lake, Marah=Great Bitter Lake, Elim=Ayun Musa, and Mt. 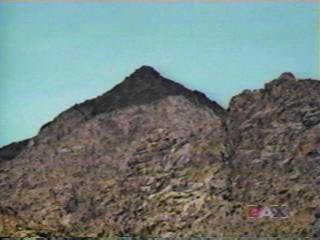 Sinai= Jebel Musa, Jebel Serbal, or Jebel Saniya near Serabit el-Khadim. I also think the Israelites generally called all the Red Sea and all the lakes of the East Delta connected by the Eastern Frontier Canal the "Sea of Reeds". Last of all, THE BIBLE NEVER SAYS MT. SINAI WAS IN MIDIAN!!! It says it was in "the far side of the desert". Shall a Lutheran agree with a Roman Catholic? If the Roman Catholic agrees with Scripture, yes. While I recognize some problems with the traditional site, it fits the Scripture record better than Jebel al Lawz. Those anonymous apologists who suggest rejecting Jebel al Lawz is rejecting the truth of God should try applying the spirit of God in their rhetoric. 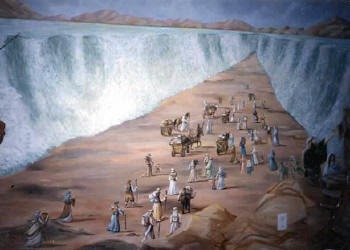 The Israelites were in the region of Etham both before and after crossing the Red Sea. They were on the edge of the Desert of Etham just three days after leaving Egypt and traveled for at least three days in the Desert of Etham after crossing the Red Sea. If the Red Sea crossing were of the Gulf of Aqaba, Etham would have to be on the east side, but then the Israelites could hardly have been on the edge of Etham before the crossing. Note, too, that they left the edge of Etham to go to Pi Hiharoth. Any location for Mt. Sinai must explain how it was that the Amelekites were present at Rephidim. Rephidim was clearly a relatively short walk from Sinai (and downstream) since Moses and the elders went from there to Sinai/Horeb to provide water from the rock. All the Scriptural evidence places the Amelekites southwest of Palestine, somewhere on the Sinai Peninsula. If Sinai were in Saudi Arabia, the attack of the Amelekites would have come long before the Israelites had left their region. Mt. Sinai was apparently along the normal route that Moses would have taken to go from that part of Midian where Jethro lived to Egypt, for after leaving Jethro to go to Egypt he meets Aaron at Sinai/Horeb (Ex. 4:27). This also suggests that Sinai was about two thirds of the way from Egypt to Jethro's Midian, for Aaron was already on his way when Moses spoke with God at the burning bush (Ex. 4:14), while Moses went back to Jethro to say goodbye and then met Aaron at Horeb. I grant that the traditional site might not be the real Mt. Sinai. In my opinion it probably is not. But given all the Scriptural evidence, the understanding of "Arabia" in the 1st Century (when the Apostle Paul said Sinai was there), the ancient understanding of the boundaries of Egypt, the fact that "Midian" was not restricted to modern "Arabia", and the logistics of travel in that region, I think one must conclude that the real Mt. Sinai is somewhere on the Sinai Peninsula. There is one aspect of this that seems to have gotten left out...or at least I don't remember anyone mentioning it. Look at the landscape its self. The Bible talks about dessert land. The traditional site on the Sainai peninsula is mountainous. Guess what is all around Jebel al-lawz...dessert. There is a video series on youtbe called "mountain of fire." It is very good. Another thought I had is this: If they were going to stop at the Sinai Penisula, why would they not just by-pass the Red Sea by going to the north where its dry land? It would be unsafe to stay there because The Egyptians could follow them. God would have known that so he led them south around the Peninsula and across where the land bridge is. God would not part the Red Sea just to have many die on the "coral". The problem is with this blog is that God's power has been left out to a large extent. God's whole purpose was to lead them to safety. On a side note they wouldn't have had to wander 40 years in the dessert if they had just been obedient to God in the first place. Another thought I had was once they got across, they would have had to double back-across the Red Sea-to get to the mountain in question. Any way, it doesn't really matter where it is in the grand sceme of things. If you really want to know then accept Jesus as your personal saviour so you will be able one day to ask God your self where it isin Heaven. "Secondly, even with the supposed evidence at Jebel-al-Lawz (and the carvings are suggested to be neolithic in origin), I have a problem with it in that it was never proposed as Sinai until Muslim polemicists argued it was so during the Crusades...Christians from the time of Christ venerated another mountain. I would be wary of it for that reason alone." Have you ever considered the possibility that Helena was wrong? Have you considered the possibility that Christianity got something wrong? The point is, if what they are describing in Saudi Arabia is the site that that story is written around, then that not only supports the idea that it was myth, but that the myth was written around actual geological formations so as to seem true. If the cave paintings are actually from Neolithic times, then that invalidates the story, and thus, parts of Exodus, and thus, reduces the probability of it being true. 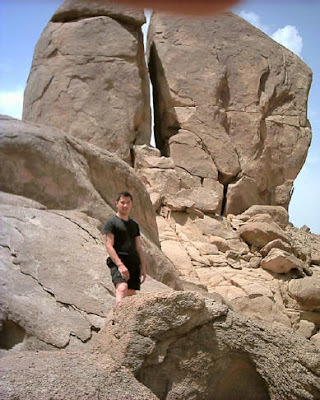 the picture showing the split rock above is NOT the same as the one found by explorers to Jebel al-Lawz.. that one is a 50-60 feet tall and show visible signs of heavy waterflow. Sinai come from the root word "sin" for moon. Mount Sinai was a place of moon worship before God cleansed it. The author seems to confuse something unique from something which is possibly holy. In fact he is unsure to get "worked up" that he suggests to himself he would need another blogger to refer his conclusions. What kind of education did you get?